The Philosopher's Wife: Wordless Wednesday: Soft Fabric . . .
Do you know the reference? When I saw this one I literally laughed out loud! We just bought some pretty fabric to recover our chairs. The question: Do I post a picture on a Wordless Wednesday or not tell the kids and surprise them when they get home. Oh, the dilemma! my mom is like that. 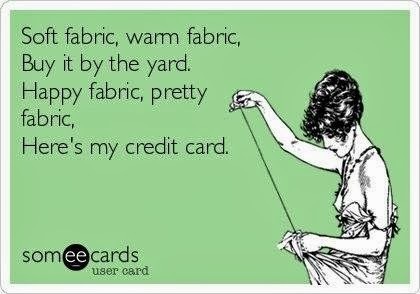 She loves quilting, so she is always buying fabric.